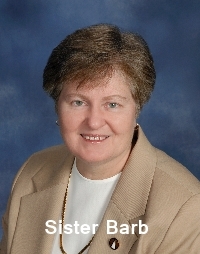 Sr. Barbara Rund, OP is an Adrian Dominican Sister. She holds a Doctorate of Ministry in Preaching (D.Min.) from Aquinas Institute of Theology at St. Louis University; a Master of Theological Studies (M.T.S.) from St. John's Provincial Seminary; a Master of Arts in Theology (M.A.) with a specialty in Liturgical Studies from the University of Notre Dame; and a Bachelor of Arts (B.A.) from Siena Heights University. Sr. Barbara has a mandatum to teach authentic Catholic doctrine and to work as a professor of Catholic theological disciplines. She is fully certified by the Archdiocese of Detroit and the United States Catholic Conference. Presently, she serves full time as the Pastoral Associate and when needed as an adjunct instructor for Siena Heights University. She is an active member of the Archdiocesan Pastoral Council and the South Oakland Vicariate Pastoral Council. Her full time pastoral experience at various parishes include the roles of Pastoral Associate, Pastoral Minister, Worship Director, RCIA Director, Director of Religious Education, Youth Minister and Elementary School Teacher. Besides her involvement in the parish, she was the Academic Dean for the Institute for Ministry at Sacred Heart Major Seminary and served as a member of the Adrian Dominican Sisters Congregation Leadership Team. She has had experience on hospital corporate boards and university boards. Sr. Barbara was a contributing author to Dominican Praise (a prayer book for the Dominican Sisters) and to Getting Ready for Sunday (a publication for children). Currently, she writes articles for the St. Hugo parish weekly bulletin.